The Tuesday bird walk stopped at the Brant Viewing Area in Qualicum Beach on our way to the Little Qualicum River Estuary. The morning was cloudy with calm winds. A raft of thousands upon thousands of Surf Scoters, White-winged Scoters, Black Scoters, Brant Geese, Lesser and Greater Scaup stretched from the Brant viewing area to the east end of Surfside Drive. At the estuary Bonaparte's Gulls, Mew Gulls, California Gulls, Iceland (Thayer’s) Gulls, Herring Gull, and Glaucous-winged Gulls lined the shoreline and all of the gravel bars from the mouth of the Little Qualicum River Estuary to the Brant Viewing Area. We estimated that there were three hundred Common Murre heading down the Strait of Georgia. Two Eurasian Widgeons, American Widgeons and Northern Pintails were seen resting on a gravel bar at the mouth of the river. 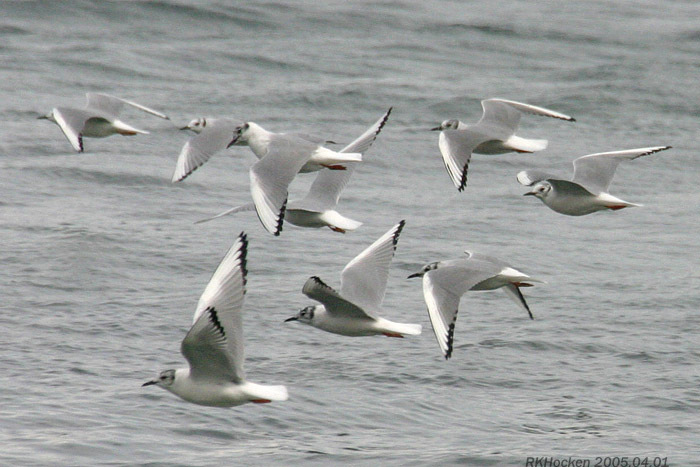 Black Oystercatchers, Black-bellied Plovers and a Black Turnstonewere seen along the shore. 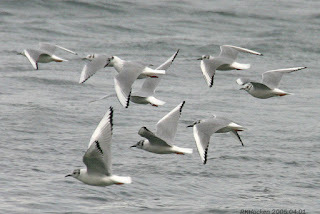 Bonaparte's Gulls: Ralph Hocken Photo. 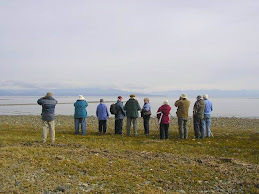 The Tuesday Bird Walk on April 03, 2018 will be going to Columbia Beach. Meet at the Parksville Community Park (near the Lions Club playground parking lot) in Parksville at 9:00 am, or at the parking area off Admiral Tryon Bld. (turn onto Columbia Drive off Highway 19a, go to the tee intersection of Admiral Tryon Bld., turn right & go about one hundred yards to parking area on your left) at about 9:20 am.